A pretty young woman sits sideways on a chair and holds an open magazine as she poses for her portrait at the Talbot studio in Loveland, Colorado. 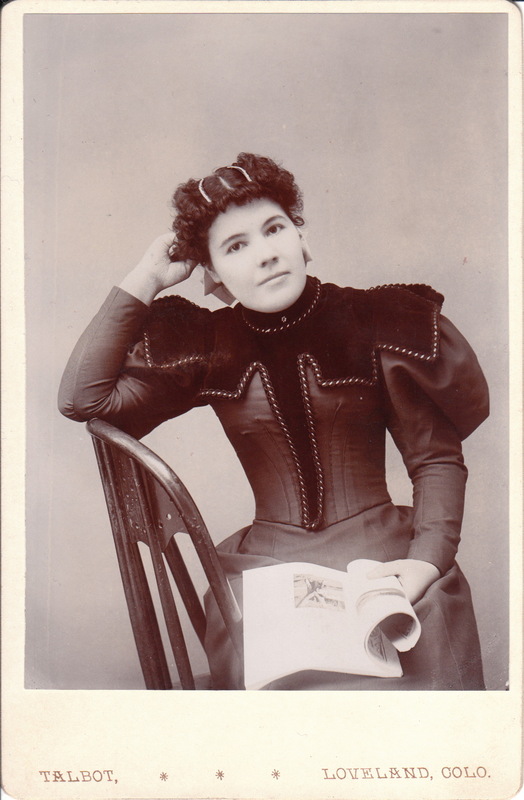 If she is indeed sitting sidesaddle on the chair; it is an unusual pose. She is wearing an interesting and uncommon dress. Perhaps a visitor to the cabinet card gallery can tell us something about the dress. What kind of material is this dress made from? What is the material of the fabric that is sewn over parts of the dress? What kind of hair accessory is she wearing atop her head? Note that she is also wearing a ribbon which can be partially seen behind her head. Are you wondering about the “Mammoth Potato Hoax” yet? I’ll get right to that intriguing story after a brief description of the town where the Talbot studio was located. In the early seventies (the nineteen, not the eighteen seventies) I used to ski Loveland’s slopes and mail valentine day cards from the Loveland post office. It was considered extra romantic to have a Loveland postmark on your Valentines Day cards. I enjoyed the town, but never knew the story of how Loveland got it’s name. Research reveals that Loveland was founded in 1877 and was named in honor of William A. H. Loveland, the President of the Colorado Central Railroad. Not many years later, Adam H. Talbot operated a photography studio in Loveland. In 1894, he was recognized nationally and internationally for his involvement in the “Mammoth Potato Hoax of Loveland, Colorado”. The hoax actually started very innocently. The editor of the Loveland Reporter wanted to help a local potato farmer, Joseph B. Swan, promote his spud sales at a Loveland street fair. The farmer was well respected for his potato production. He had grown 26,000 pounds of potatoes on one acre of land over a years period. He had claimed to have grown a giant potato weighing 13 lbs, 8 ozs. In an effort to create a humorous advertisement for farmer Swan, the newspaper editor recruited photographer Talbot to use trick photography to create a photograph of Swan holding a massive potato over his shoulder. Printing below the image stated that the potato weighed over 86 pounds. Unfortunately, or fortunately, depending on the participants point of view, many people believed that this attempt at humor was actually reality. Word spread about this amazing potato. Eventually, a New York City attorney sent the photograph to the editors of the Scientific American. The attorney included a note that stated that the actual potato had been on exhibit at the Loveland Reporter offices. The editors ordered an engraving of the photograph to be made and than published it as real news in an 1895 issue. Eventually, the editors became aware of the truth about the photograph and published an angry retraction. The magazine reported it was victim of a “gross fraud” and stated unkind opinions about photographer Talbot. They asserted that “An artist who lends himself to such methods of deception may be ranked as a thoroughbred knave, to be shunned by everybody”. The story of the “mammoth potato hoax” went viral, 1890’s style. It was widely reported but still many were not aware that the giant potato never existed. Farmer Swan was besieged by letters asking for information and offering to buy his amazing potato seeds. Swan would try to explain that the famous potato never existed, but people did not believe him. Eventually, Swan just told inquirers that the potato had been stolen. Incredibly, the story of the huge potato appeared in The Strand Magazine (1897), and it was reported as true news. After some years had passed, Talbot finally received some positive acclaim in the St. Louis and Canadian Photographer (1902). Talbot was recognized for producing photographs for a book named “Loveland, Colorado Illustrated”.